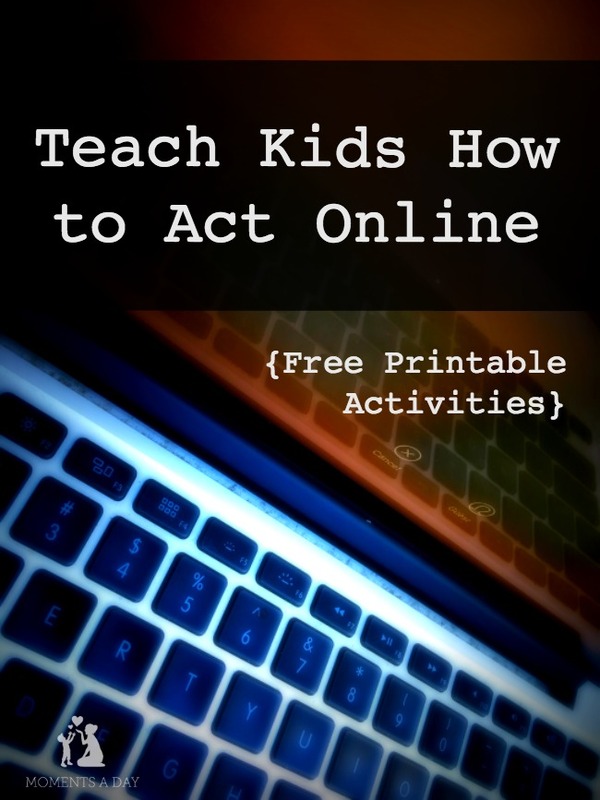 If you are looking for ways to teach kids how to act online, these discussion questions and printable activities might help. Can you imagine growing up in today’s world? Where photos don’t have to be printed to be seen, information can be instantly transported via computer or phone, and anyone can blast news around the world in an instant via social media? There are so many differences since I was a child in the 1980’s! Our kids are being conditioned in a totally different society than we were. With Google at their fingertips and screens everywhere it may be hard for them to imagine a tech-free world. Their existence is one where the words “Facebook” and “emails” are learned as early as “call” and “write.” The terms digital consent forms, passwords, and cyberbullying are just part of the regular vocabulary and routines of life. As much as it may be scary to know this, there are also a great number of benefits that this new technology-filled lifestyle offers. Being able to watch a youtube video for how to do a science experiment, for instance. Or being able to stay in touch with family who live overseas via social media and Skype. But there are also risks and concerns we must help our kids navigate as they grow up and explore all the pros (and cons) that life online has to offer. My latest reading of my storybook Mason’s Greatest Gems, which shares the story of a little boy who finds a special gemstone and then learns the analogy of “mining inner gems” as virtues you can practice every day, was at a library where they were raising awareness for Cyberbullying and Online Safety throughout the week. 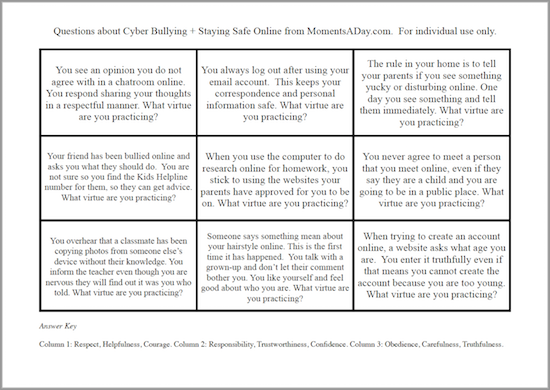 It got me thinking about how virtues – like in the book – should be practiced online, and how this is a lovely way to frame cyberbullying prevention and online safety awareness. Because being kind and helpful and responsible is as important online as it is in “real” life (because both are truly real). For our discussion after the book reading, I created some discussion questions (which could also be used as a “fill in the blank” activity or word find) which are copied below plus available as downloadable PDF printables in case they are handy for talking to your kids or classes about these subjects. For both of the activities, I would advise to write the answers on a board on a piece of paper so the children can have a variety to choose from. You may like to cut up the different questions and hide them around the room, or stick them under chairs as a surprise activity after a discussion… the possibilities to make the activity fun and engaging are only limited by your imagination. I am (what) about how I behave online. I visit only websites my parents or teachers approve. 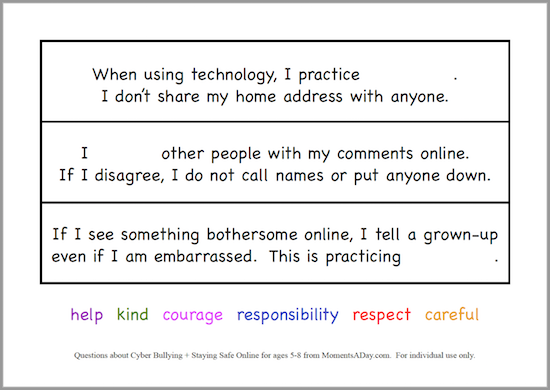 I pledge to be (what) online. I share encouraging and positive messages. The internet is a tool you can use to (what) others. You can learn new ideas as well as share what you know. When using technology, I practice (what). I don’t share my home address with anyone. I (what) other people with my comments online. If I disagree, I do not call names or put anyone down. If I see something bothersome online, I tell a grown-up even if I am embarrassed. This is practicing (what). You see an opinion you do not agree with in a chatroom online. You respond sharing your thoughts in a respectful manner. What virtue are you practicing? Your friend has been bullied online and asks you what they should do. You are not sure so you find the Kids Helpline number for them, so they can get advice. What virtue are you practicing? You overhear that a classmate has been copying photos from someone else’s device without their knowledge. You inform the teacher even though you are nervous they will find out it was you who told. What virtue are you practicing? You always log out after using your email account. This keeps your correspondence and personal information safe. What virtue are you practicing? When you use the computer to do research online for homework, you stick to using the websites your parents have approved for you to be on. What virtue are you practicing? Someone says something mean about your hairstyle online. This is the first time it has happened. You talk with a grown-up and don’t let their comment bother you. You like yourself and feel good about who you are. What virtue are you practicing? The rule in your home is to tell your parents if you see something yucky or disturbing online. One day you see something and tell them immediately. What virtue are you practicing? You never agree to meet a person that you meet online, even if they say they are a child and you are going to be in a public place. What virtue are you practicing? When trying to create an account online, a website asks what age you are. You enter it truthfully even if that means you cannot create the account because you are too young. What virtue are you practicing? To download the printable, click here. 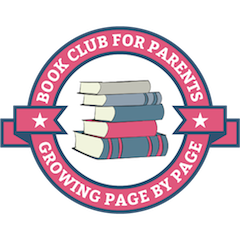 Here are some other useful links if you have time for more discussion and activities with your class.